The FCA successor to the inept FSA regulator is finally going to act to put a CAP on the pay day legal loan sharks industry a good five years later than they should have acted had the financial regulator the best interests of the general public in mind rather than Britains banking crime syndicate. To be clear the proposed 100% cap is NOT on the rate of interest charged which at the suggested rate of 0.8% per day still works out to an APR of about 300%. But more importantly it is a CAP on the maximum that can be charged in INTEREST and FEEs so should bring to a HALT to the payday loans industry scam of hooking desperate financially illiterate borrowers into easy to obtain text message small loans of several hundred pounds that soon mushroom to several thousand pounds, a practice which should cease as of January 2015. The effect of this should be to KILL most of the payday loans industry off for the business model has just gone up in smoke as they can no longer for instance turn £100 loans into £10,000 debt mountains. And as the business model goes up in smoke so should it become far harder for the financially illiterate to borrow as the cap in effect will FREEZE the pay day loan books as they seek to wind down their business. Many of the floated pay day loans company stock prices can be expected to literally crash when the stock market starts trading later this morning which will act as a prelude to MOST pay day loan divisions of the banks also disappearing over the coming months as i warned of in November last year. Nov 24, 2013 - Pay Day Loans Judgement Day - Could Interest Rate Cap Trigger Ponzi Debt Industry Collapse? Pay Day Loans Subprime Debt Industry Collapse? Whilst its good news that the FCA will finally be targeting the the aggressive debt collection practices of the largely unregulated payday loans industry that has mushroomed over the past 5 years to stand at well over 250 providers, all competing against one another to lend money to those that cannot afford to repay the loans in what appears to be a classic Ponzi scheme-esk structure where loans are usually given to individuals without any background checks that are increasingly for the purpose of repaying loans taken out from other payday lenders, and then again and again which means that payday lenders are effectively paying one another resulting in what is a growing Ponzi pyramid primed for collapse. You all should know how this could all end for we have seen it all before with the US subprime crash that triggered the financial crisis of 2008, something that we are still trying to overcome. In fact Payday Loans is Subprime on speed, which means that when the Pay day loans Ponzi bubble bursts it will be in a far more spectacular style than the slow burn that was subprime crash that started to go belie-up in early 2007, taking a good 18 months to hit the financial armageddon stage. With the stage now set for the government to finally start to act to deal with these legalised loan sharks, so the pay day loans industry is primed for a market to collapse, because financial markets discount the future, they propel a trend into the stratosphere that is primed for a crash, just as is the case with every bubble. The new UK Housing Markets ebook ( FREE DOWNLOAD) contains extensive coverage of the dangers of debt and suggestions on how best to manage debt. The point is, where are these payday lenders getting their money from? I cannot believe they have a genuine capital pool. Is it not the case that we have the BOE to thank for the explosion in payday lending that they are now trying to pretend to save us from, in that they provided the credit lines in the first place? 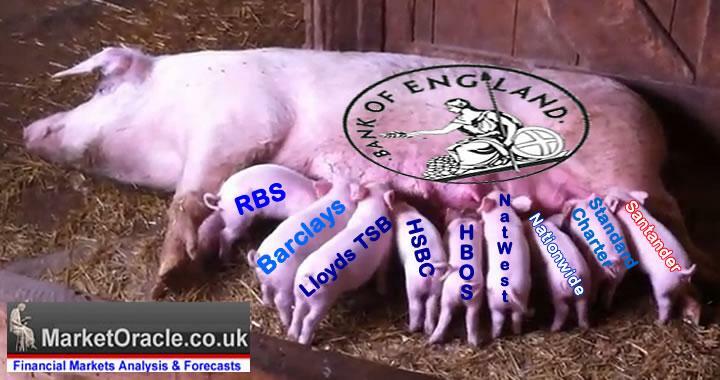 The Bank of England has always worked primairly for the BANKS, next printed money for the government. Which is why the regulator did NOTHING for 5 years.